Lots of people were out there with you. After more than 18 months of intensive election coverage, early voting kicked off in Harris County on Monday with long lines at some polling locations. As polls closed at 6 p.m., more than 63,000 people had turned out for the first day of early voting, shattering the previous record of 47,093 set on day one of early voting in 2012. In the first 2.5 hours of early voting, the Harris County Clerk’s office said 15,205 ballots were cast–one third of the total cast all day on the first day of early voting in 2012, about 47,000. By the afternoon, the county was averaging 6,000 voters per hour, and the clerk’s office projected a record-breaking 60,000 votes by the time polls close. When the clock struck 8 a.m. Monday, opening time for early voting, a line stretched out the door and across the patio at the Metropolitan Multi-Service Center on West Gray, typically among the county’s most popular polling spots. Thanks no doubt to the later hours for early voting and the sheer volume, I don’t yet have the daily EV report for each location. I’ll post those as I get them, and I will add a new tab to this spreadsheet, which contains the daily EV totals for the 2004, 2008, and 2012 elections. The 2008 election has the reputation for being the blow-the-doors-off one for early voting, but 2012 did indeed have a higher volume, both on Day One and overall. It also had more EV locations, which no doubt helped ease things a bit. Not mentioned in this story is that as of the weekend, over 52,000 mail ballots had been returned already, with another 60,000 or so still out and still a few days left to request them. I’ll have more on this as we go, and I don’t want to draw any broad conclusions from such limited data, but it sure seems like we are headed for a record total of ballots cast. Not just here, but around the state. That’s a function of a lot of things – some locations are always more popular than others (see: the Metro Multi-Service Center on West Gray for Exhibit A), and some places have enough voting machines to better handle a sudden influx. RG Ratcliffe has an idea about who may be voting. Throughout this election, I’ve been skeptical that Hillary Clinton could carry Texas, even as polls suggested the gap in support between her and Donald Trump is closing. But there is a wild card that might make it possible: There are 532,000 more registered Hispanic surname voters this year than in 2012. Over the past week or so, one news story after another has touted the close race between Clinton and Trump in Texas. The gap has closed, but Clinton seems to be stuck at the same level of support that President Obama received in his 2008 and 2012 campaigns. Obama received just under 44 percent of the vote in 2008 and 41 percent in 2012. Clinton received 43 percent in the CBS/YouGov poll; 41 percent in the UPI/CVOTER; 46 percent in Washington Post/Survey Monkey; and 38 percent in the University of Houston poll. All the while, Trump’s numbers have declined in Texas from a solid majority to levels in the mid 40s. Three out of the four recent surveys put the gap between Clinton and Trump within the margin of error. Trump’s gaffes and personal history have led to voters fleeing his campaign. Still, the formula for a Clinton victory in Texas has always required that somewhere between 950,000 and 1.2 million people who voted for Obama’s Republican opponents either switching to the Democratic candidate or sitting out the race. It’s now looking like at least half those voters may do exactly that by either not voting in the presidential race or by casting a ballot for one of the third-party candidates, Libertarian Gary Johnson or Green Jill Stein. The other half of the gap conceivably could be closed by newly registered Hispanic voters. RG’s point about Clinton’s level of support in the polls is well-taken, though I would note that poll averages have underestimated candidates of both parties in the last two elections. As for the rest, well, that is certainly the hope. I’ll have Day One data in tomorrow’s post. Have you voted yet? What was your experience? I expect to vote today and will let you know how it goes. 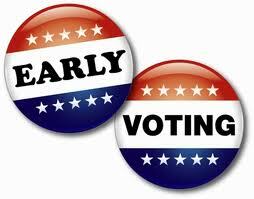 If you haven’t voted yet, Andrea Greer explains why early voting is the way to go. The Current and the Press have more. UPDATE: Here is the Day One EV report from the County Clerk. I’ll begin adding these numbers to the spreadsheet today.